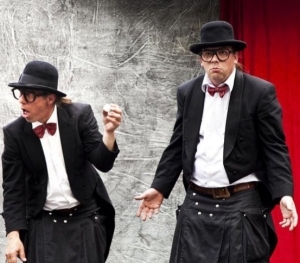 From Germany, the comedy and energy of this father and son clown duo have been a central part of the festival’s original inspiration and a good bit of the imagery and cockeyed outlook that allowed us to believe that this impossible event was actually inevitable. Hacki has owned and operated Variete theaters in Berlin and Muenster and he and Moeppi have left them laughing all across Europe. Man, are we glad to have them back with us at the 2018 Moisture Festival!